Also available in hard copy to all credentialed media are the following materials from the Church of Scientology International. To order, please click to the online order form (at the bottom of the page) that follows. A definitive and comprehensive 590-page reference work, containing cover-to-cover facts about the Scientology philosophy, its history, practices, activities, organizations, membership, community programs, and inroads Scientologists are making in improving the quality of life through application of the technologies developed by Scientology founder, L. Ron Hubbard. The most in-depth work ever published on the life of Scientology founder L. Ron Hubbard, this book chronicles Mr. Hubbards lifetime of accomplishment in the 29 professional fields he mastered. A concise, yet comprehensive status report on Scientologys four decades of worldwide expansion. Includes a complete look at the Churchs ecclesiastical structure, its management, its community assistance programs, social reform activities and affiliated parishioner organizations. 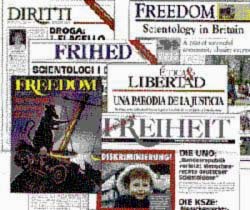 A 42-page reference guide of facts written to assist media in coverage of both the Church and the Scientology religion. A forum for hard-hitting investigative journalism. Freedom has taken on stories that other media have been reluctant to publish. Resurgent human rights violations against minorities in Germany have captured international headlines in recent years, but few reports have scratched the surface of the deference afforded to hatemongers by the Bonn government. This 167-page white paper fully documents the source and scope of "neo-cleansing" propaganda inside todays Germany. A 145-page documented analysis of the violence and crime incited by the now-bankrupt Cult Awareness Network. Question: Where does one turn when a four-bit news magazine wields the unabashed Nazi-style hate propaganda that TIME did in its 1991 cover article on Scientology? Documenting every move of the cabal behind this vitriolic attack, this booklet exposed the real story of mafia-like tactics used to try and bring Scientology down. A description of how this law works, its purpose, history and importance. It provides simple, straightforward steps to access information from U.S. government agencies. Originally published as a public service by the Church of Scientology, this information is now available online at the Electronic Freedom Foundations web site.